Here is my second post in honor of Calvin's birthday regarding the reformation of the church. Check the sidebar under "Celebrating Calvin's Birthday" for my posts on this theme. Yesterday, I published Bob Funk's 21 theses. I think they are right on and I greatly admire Funk's no nonsense, take no prisoners, straight talk. 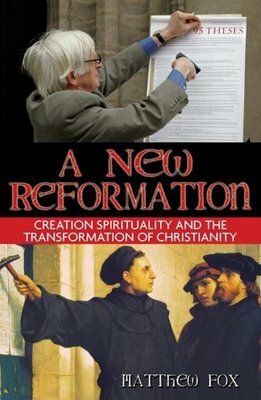 Matthew Fox wrote a book a few years ago entitled A New Reformation: Creation Spirituality and the Transformation of Christianity. Fox included his own 95 theses and posted them on the Wittenberg door! Take time to look these over. I included all 95 in this post as they are all gems. If I had one of those church signboards, I would put these 95 theses up one at a time for the benefit of the good folks in Carter County, Tennessee. In regards to my theme of vows for membership and leadership, I especially like theses 8, 25, 28, 30, 34, 39 & 69. I am thrilled that Matthew Fox is going to be in Asheville, North Carolina in a couple of weeks for the third annual Creation Spirituality Communities Event, Breathing Compassion, July 16-20. It begins with a "Hot and Holy" Cosmic Mass on the 16th at 7 p.m. I plan on taking in the entire conference as a continuing education week. There is space for you, too! If you think the church is in for Reformation, come join us! 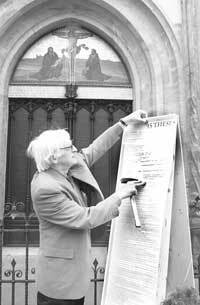 Matthew Fox pictured at right posting his 95 theses at Wittenberg. Martin Luther was the original radical who started the Protestant Reformation in 1517 with his 95 Theses. The following is from Yes! Magazine. 41. The body is an awe-filled sacred Temple of God and this does not mean it is untouchable but rather that all its dimensions, well named by the seven chakras, are as holy as the others. I confess that my lip curled a little, just a little. I've been to churches which practiced a kind of new-agey (I'm searching for another word, but I'm not finding it) crap that really puts me off. If the folks who go there like that sort of thing, then fine, but I don't see that it has much to do with God. It seems to be more about affirming me, me, me. As I see it, faith must be much more about others, than about me. I guess I see spirituality as too broad a label to be satisfying to me, if we're talking about a relationship with God. That's funny! I understand what you mean and I had the same reaction. I think I understand what Fox (and others who say such things means). Religion is rules and dogmas and hypocrites. Spirituality is about freedom, justice, love, etc. Religion to me is about hanging in there with a community through thick and thin (religio bound together). Spirituality can be a little non-committal? I spoke about religion/spiritual thing on Easter, Easter for the non-religious. John, your Easter sermon is lovely, especially since Easter is one of the days when the two-times-a-year folks show up. You gave them something meaty to chew over, at the same time that you fed your flock. Today, one of the readings from the lectionary was from Samuel, when Samuel goes to God with the demand of the people for a king. God lays it out for them why a king will be a very bad thing for them, but they want their king, and God gives them what they want, an earthly kingdom. ‘No! but we are determined to have a king over us, 20so that we also may be like other nations, and that our king may govern us and go out before us and fight our battles. ...that would be a bad judgment call all right in regards to kingship. "...don't ask from God what you can get from Pharaoh." That's a really good prayer. A laundry list may be apt, but it was a list after a career of reflection. No "undergraduate" could write this. Fox has proven his mettle after 26 books, a battle with the Vatican, and a rediscovery and articulation of a theological system of thought, Creation Spirituality. As far as I am concerned, he is the real deal, and that's whether folks agree or disagree with part or all of his ideas. The list reads to me like a list of heuristics one picks up along the way. It takes time to pick them up. There is deep and understated wisdom in most of them. A couple are too temporal, like the one that picks on Fascism. It is true, and it is likely singling out Rome's fascination for Gen Franco and their guardianship of Valle de Los Caidos, but does it merit a whole entry? It is symbolic of Rome's ancient envy of Empire. It is after all symbolic of all authoritarian Church models and their endless fascination with power. Good thoughts, Jodie. The individual items on Fox's list is a thesis. There is a lot of thought and experience, collectively and individually, that has gone into each one. I wondered if some of these now seem rather obvious (such as appreciation of other religions) which shows the change that people now take for granted. I would read his book Original Blessing, his primer on Creation Spirituality published 25 years ago. That is the book that got him in hot water with the Vatican. The book, A New Reformation, tells his story and fits these theses in that context.